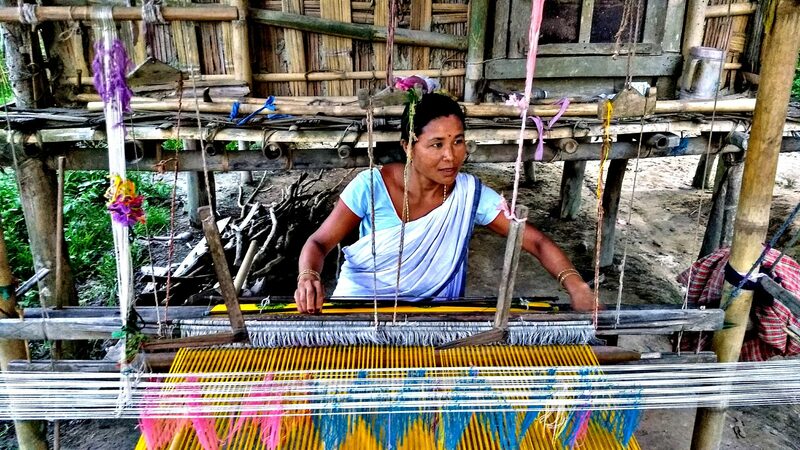 THE WEAVING HEARTS OF PANBARI, ASSAM. Ever held a hand-woven piece and felt it deeply? The threads and the patterns are embedded with the warmth of an artisan’s love. Hidden beneath the intricate mesh of threads, are innumerable tales of the yore. Hand-woven represents the work of love; of hands. Our hands are one of the most powerful sources of energy. They are built for creating, receiving and sharing energy. The hands are directly connected to our hearts. A work of hands flows straight from the heart. This is the magic that weaving creates. Since ancient times, many tribes across the world have been bound by the art of weaving. Weaving represented the togetherness of the community; held by threads of love. It was the work of a woman – the feminine who holds everything together with the energy of the heart. And there I was in this quaint Mishing Village of Panbari where many a ‘Shaktis’ have held the tribe together with their beautiful works of art. I was here with a purpose to uncover the very fabric that binds the Mishing Tribe. 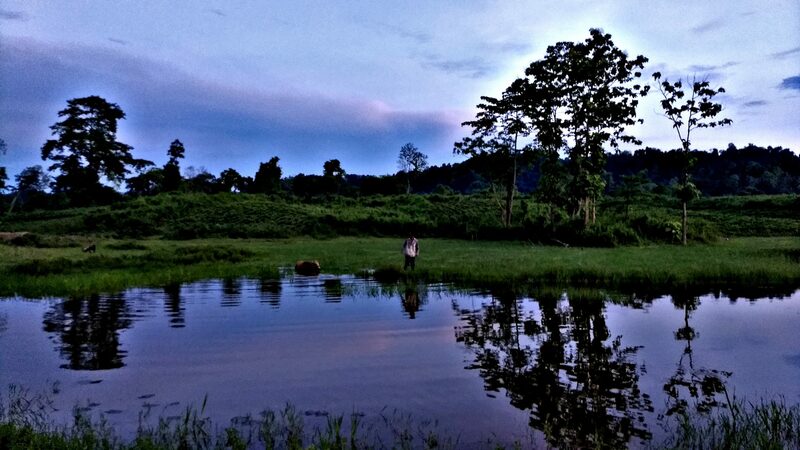 A heady mix of buses, jeeps and hot Assamese chais on roads laced with lush lotus fields and lakes brought me to the little village of Sabjuri in the Golaghat district of Assam. 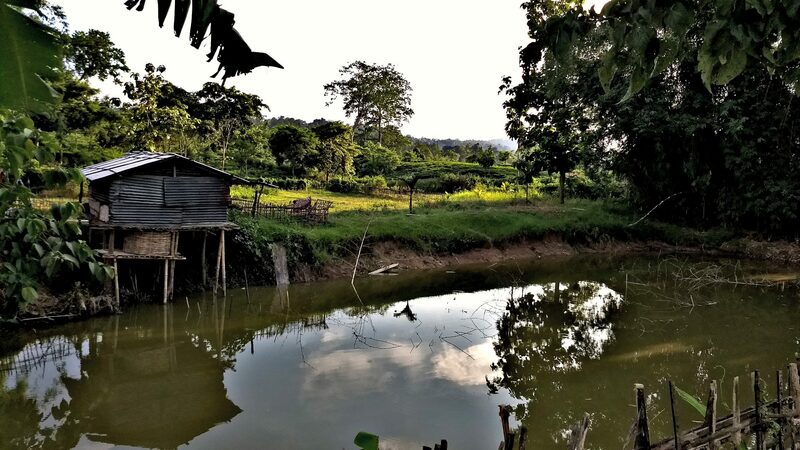 From this point onwards, I was received by my host Mr. Ranjeet Doley to move forward into the forest reserve of Panbari – a quaint village remotely located on the other end of the Kaziranga Forest. Riding through a rocky road on his scooter, I entered the serene world of the Mishing Tribe. Hailing from the Indo-Mongloid race; this aboriginal tribe of Mishing were mountain dwellers who migrated to the plains during 12th and 13th century A.D in search of fertile lands and settled by the Brahmaputra river in Assam. A traditional folklore amongst the Mishing states that they were the Mirik – which means ‘the offspring of man’; descending from the Abo-Tani – the first pure man. Another Mishing lore states that the God of learning taught them alphabets that a Mishing wrote on a Deer skin. And one day a Mishing ate the Deer skin; hence all traces of written language were lost. Thus, their traditions were only passed on orally from one generation to another. Upon arriving, I was greeted by the warmest smiles of his kids and a glass of fresh lime juice. Mr. Doley was extremely generous to have made arrangements for my stay at his Chang Ghar – a stilt bamboo home of mud and thatched roof. Waiting at the door, was Mr.Doley’s wife Rekha who is one of the master weavers in the village, renowned for her beautiful loom works. After resting for a while, I set out for a leisurely walk in the village. Mr. Doley – a teacher at the village school was generous in sharing the ways of the Mishing tribe with me. We were to visit the village loom the next morning to understand the processes of a traditional loom and meet other weavers in the community. Every home in the village had a traditional loin loom; which itself is a reflection of weaving being the backbone of the Mishing Tribe. Weaving has always been a way of life for the Mishing Tribe. Each piece worn by the members of the tribe for regular and traditional use were woven by the women. The women wove all the clothes required by her after marriage before getting married. She weaves the clothes for the entire family. The vibrant colour combinations and intricate motifs are intrinsic to Mishing weaves. Traditionally; there is a specific woven attire for every occasion and phase in an individual’s life. For ages, the Mishing motifs have been inspired by nature – the flora and fauna around their settlements. These designs represent their closeness with nature. Just as any other tribe that regarded Mother Nature and her spirits as their beloved teacher. The women often express their day-to-day life, dances and the nature around them through their loom. Some of the traditional motifs include geometric shapes like triangle, diamond, mountains and stars; and motifs such as butterflies, trees, flowers, birds, elephant, deer and horse (Dumso) that were drawn from Mother Nature. The Mishings are ardent worshippers of the Donyi Polo. Donyi represents the Mother Sun and Polo represents the father moon. The sacred symbols of ‘Do-ni-polo’ – the sun and moon deities were also commonly used for traditional attires. Other traditional motifs such as Kangar, Laksin Gamik, Xorai, Butaphul, Mokora, Babori, Chorai, Mihiphul and Donyi-polo Yaksa are used even today. Colours of the weaves are culturally symbolic. The black coloured attire with stars and colourful flowers represented the backdrop of the night sky – the darkness. The colour red represented the fertility of Mother Earth. White stood for purity, green for the lush nature around; while blue represented the limitless sky. A North-eastern legend has it that; a girl named Hambrumai was the first weaver. Hailing from the Mishmis tribe of Arunachal Pradesh far away in the mountains; she was the first one to receive the gift of weaving from the Matai – God. Deep in the wilderness, Hambrumai sat by the river; learning motifs and designs from Mother Nature. Often the beautiful butterflies, birds, bees, the plants, flowers, trees and the flowing river. She wove nature so deeply and beautifully into a cloth as if they were a work of Matai – the God. One day Hairum – a porcupine was love-struck by her beautiful creations and was tempted to steal her loom. He barged into the cave where Hambrumai lived to steal the loom. Due to the narrow opening of the cave; Hairum couldn’t enter the cave. While Hairum forced himself into the cave; it crumbled and Hambrumai was crushed under the giant rocks. The loom was broken into pieces and flowed away with the river. The flowing river carried the remains of the broken loom to the plains where the people by the banks found them. Thus, the people learned to weave. They say; the beautiful designs on the loom turned into butterflies and became a part of their wings. Such is how the art of weaving was shared from the first weaver to the other tribes in North-east. And weaving became a work of God within the tribes. The Traditional attire of the Mishing women is the Yakan Age Gasar; commonly known as the Mekhela Chador. On festivals such as Bihu and Ali Aye Ligang, the women deck up in their special hand-woven Ege, Eri, Ribi, Hachoti, Gaseng and Gero Segreg attires. An Eri is a silk shawl that is an important cloth preserved by most women. It is gifted to a woman by her mother on her wedding. An Ege is a mark of honour for any women. A grandmother in the village told me that the Ege is the honour and weapon of a woman. In exceptional situations, if the woman’s honour is in danger or if a man bought her disgrace; she could hit the man with her Ege publically. A man beaten by an Ege socially loses his honour and chivalry in the tribe. In ancient times, natural dyes derived from plants and flowers were used to dye threads these fabrics. The men of the tribe wear the Gonru Ugon – a dhoti, the Mibu Galuk – a shirt and the Gamosa Dumer – a white rectangular scarf with red motifs. Culturally, the hand-woven attires worn in the tribe represent their gender, status and role in the tribe. The married women wear attires with horizontal white, red and black stripes to ward off the evil eye. It is a custom that the unmarried girls must weave their wedding attire and a ‘Nisek’ to carry a baby before the wedding. A Gaddu is a thick and fluffy blanket which was woven traditionally for the family. Weaving is significant for a Mishing during every cycle in their lifetime; from birth to death. The four cycles – birth, adolescence, marriage, and death involves special hand-woven attire that’s created by the women of the family. The Gamosa is an important offering to the deities as a mark of devotion. A special cloth is woven to cover and bury the dead to keep their soul connected to the tribe and prepare it for an afterlife. They believe that the threads of the fabric bind the deceased soul and ancestral spirits to the rest of the tribe forever. A woven piece here represents the life of the weaver; her ability to transcend these cycles and surrender to the mysterious nature. It’s the life of the weaver delicately interwoven on the fabric with love and grace of the divine source. This goes to say that for a Mishing; weaving is a sacred process and an integral part of their existence. In a Mishing community; weaving is always the work of a woman. They believe that this sacred art is a gift to womanhood and must only be practised by women. Weaving is an art practised as a sacred duty and passed on from one generation to another. As per customs, every Mishing woman is a skilled weaver. Today, weaving creates economic growth and sustenance for the community. This is intriguing considering that in a few communities in India, weaving has been also practised by men. But given their cultural context of worshipping the Donyi-Polo – Mother Sun and Father Moon which is different from the rest of India where Sun is worshipped as the father and Moon the mother, it makes sense. It can be seen in their ways, how their tribe is driven by the feminine. The term feminine is not about the gender – male or female. It is about the heart-centric approach to life which is feminine in nature. The men of the tribe deeply honour their women. This beautifully depicts the significant role of a woman in the Mishing tribe. Women are honoured for the sacred art of weaving and bringing light into their lives. It is evident in their way of life; how a woman invests her full potential in nurturing and sustaining her community. It is beautiful to learn the commonness in the way of life of tribes across the world. Weaving in tribes around the world is associated with a ‘Spider’ spirit who passed on the art of weaving to its first people. Be it Anansi of African Folklore to Iktomi of the Native American folklore or the Hindu Spider Goddess Maya; a Spider from nature represents weaving, wisdom and the cycles of life. I can totally relate to this because my sacred geometric weaving arts venture ‘Iktomi’ was born out of an ancient lore of the wise spider spirit. Personally, connecting with these tribes has been an enriching journey for me. Penning down this story for others to read is my little contribution to the lives of these deserving indigenous tribes. I hope this little effort to reach out, invites support and goodness into the lives of these tribes. I am extremely grateful to have been connected to this weavers village and Mr.Doley’s family through Ms. Haseena Kharbih. She is one of the most incredible women in India who wove more than 30,000 women weavers of the North-east together and empowered their dreams through her social enterprise – ‘Impulsempower’. She strived to light up the lives of the North-eastern women by making their local handlooms, arts and crafts available to the world; thereby keeping these old traditions alive. This has enabled the tribes to stay rooted to their traditions for a livelihood and offered them a wider platform to display their skills. In fact, Mrs. Rekha Doley is one of the master weavers who is growing stronger with Impulsempower. Hasina’s staunch determination and efforts have not only generated a sustainable livelihood for the local tribes; but also rescued many women from the evils of prostitution and human trafficking. They curate works of women weavers from several north-eastern tribes such as Ani, Mishing, Kharbi and many others. These weaves are then exposed to larger platforms across the world to create credibility, recognition and sustainability for each weaver. From scarves to bags, they create a range of exclusive hand-woven pieces. Today her social enterprise works on shaping the lives of north-eastern tribes and creating awareness on several social evils. Additionally, through Impulsempower Travel, they aim at promoting experiential rural eco-tourism in the tribal villages; thereby letting travellers get a glimpse of the tribal way of life. I cannot thank Ms. Haseena enough for connecting me to these lesser known weaving villages and helping me learn about their culture in-depth and be moved by their hospitality. And I must admit, Rekha is a brilliant cook. As a token of love, she gifted me her own Mekhela Chador as she was not ready with a new piece. I am deeply moved by this gesture. I will cherish my memories with Mr. Ranjeet Doley’s family and hope to see them again someday. So if you are looking forward to an enriching and authentic village experience, then you must definitely get in touch with them. If you are someone who loves to shop for ethnic fabrics while you are in Assam; I suggest you buy from these families and help them grow. A little act could fetch their children education and uplift their lives. And you will surely carry back home – beautiful works of love. What’s more, a little bit of your good Karma can light up the lives of these tribes. Next Next post: SAIRU SAJJA: Celebrating harvest in Jagatsukh village. Really captivating post! You have such a fantastic way with words and the whole experience sounds amazing! Hi, i think that i saw you visited my blog thus i came to вЂњreturn the favorвЂќ.I’m attempting to find things to improve my site!I suppose its ok to use some of your ideas!! Sorry sir, it’s not okay to use some of my ideas. I just want to mention I am just all new to blogging and site-building and certainly loved you’re web page. More than likely I’m likely to bookmark your website . You really have fabulous articles. Thanks for sharing your website. I have seen many useful things on your web page about computers. However, I’ve got the impression that notebook computers are still not nearly powerful sufficiently to be a option if you typically do jobs that require a lot of power, including video touch-ups. But for world wide web surfing, word processing, and many other typical computer functions they are fine, provided you cannot mind the tiny screen size. Thank you for sharing your thinking. I just got done eating a platter of spaghetti before visiting your site. It sure makes the full feeling all that much better. I got what you mean, appreciate it for putting up. Woh I am pleased to find this website through google. Thanks for a marvelous posting! I seriously enjoyed reading it, you will be a great author.I will ensure that I bookmark your blog and definitely will come back at some point. I want to encourage you continue your great work, have a nice holiday weekend! Think I can be your next Holidify Explorer 2018? Vote for me and share your love. Thank you! 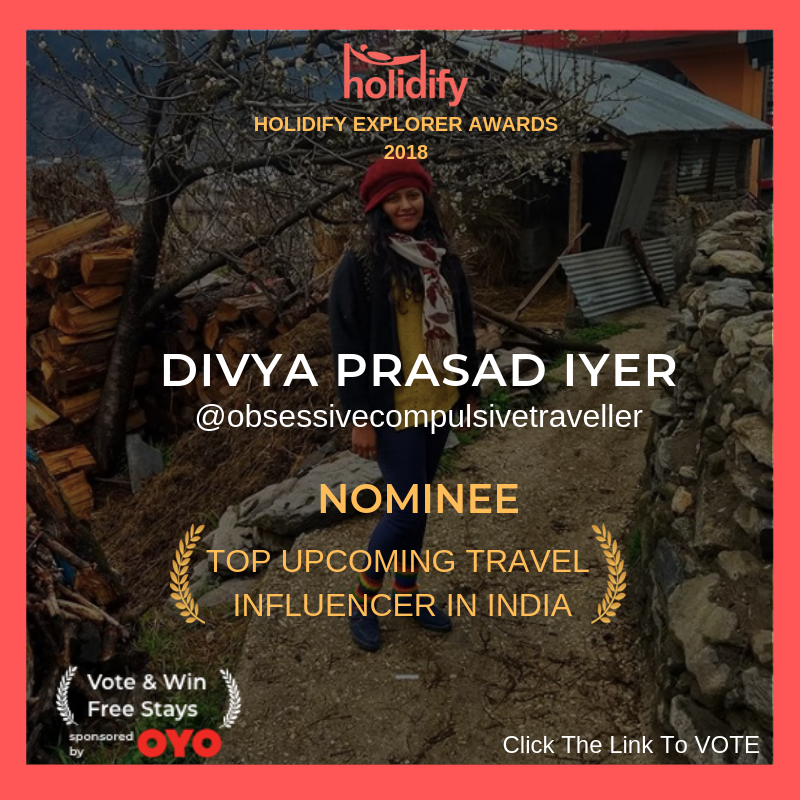 I have been nominated in three categories for the first edition of the Annual Holidify Explorer Awards 2018 in the following categories. You can find further details of my nominations and vote here. 3. 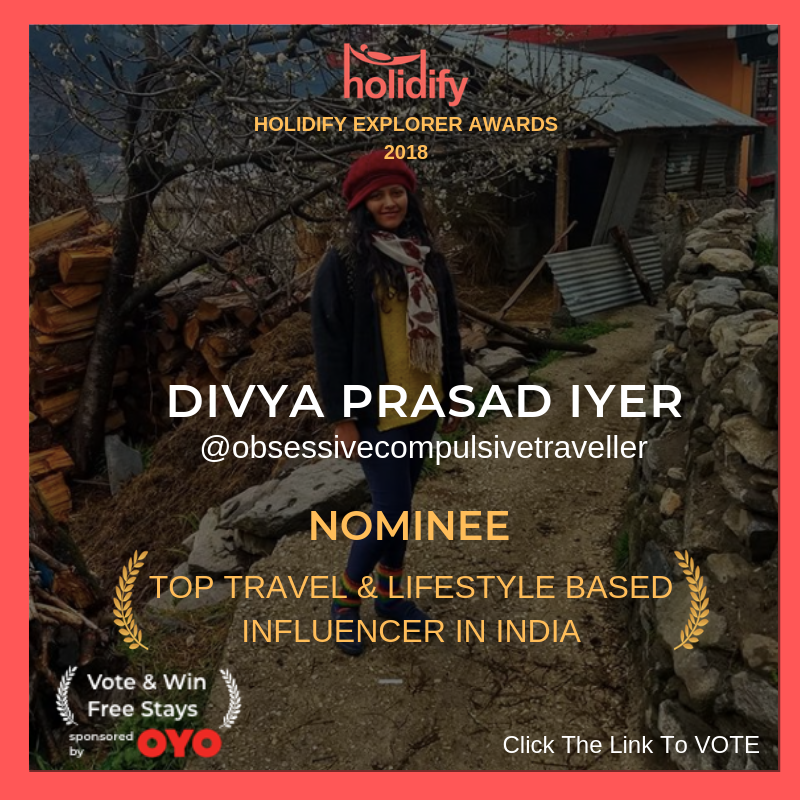 Top Travel & Lifestyle Based Influencers category. Your votes for each category means a lot. Please spread the word and pass it on if you wish. Subscribe for inspiration on unique travel experiences!